The annual SAI Summer Fiesta concluded on Tuesday, May 15, 2018 with loads of fun and fervour. In the 12-day long fiesta,children unleashed their imagination and creative self by wholeheartedly indulging in various activities like making customised T-shirts through block painting, creating paper pin wheel and preparing nutritional delights. They also skilled up their talent in singing, dancing and acting besides learning the basics of handling camera and swimming. Students had a wonderful movie time followed by a small activity, which reinforced their learning from the animated films. Expert trainers from Shiamak Davar Institute for Performing Arts, Akshay and Rashi, came from Mumbai and Bengaluru, to train the participants during the 12-day fiesta. 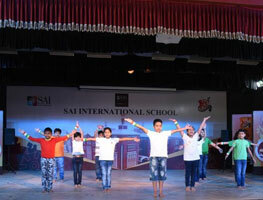 They highly appreciated SAI International School, the ever friendly teachers and the enthusiastic children for their zeal for learning and picking up the skills really fast. Parents of the participants actively took part in the valedictory function held in the Indraprastha auditorium of SAI International School. They enthusiastically learnt few steps of dancing from the trainers and joyfully danced to some of the Bollywood tunes. Principal Shri Harish Sanduja in his address said that “Children are neither better nor worse nor equal to any one, they are just unique and incomparable and added that we should not try to compare children. A group of hundred participants divided into three groups had a wonderful time amidst a safe, wholesome and friendly environment. Children were highly receptive to new ideas, and enjoyed the activities that encouraged them to visualize and create. SAI Summer Fiesta is designed to empower the children by inspiring their imaginations and broadening their creative minds through exciting, interactive activities. It continually strives to provide new and unique opportunities for the children to learn, play and be active.